Breakfast of Champions won what is already being called the most sensual bocce ball victory of all time by people around town (mostly me). Black Jesus playing SMACzilla by the water. Was it cold? Yes. Did it snow? Kind of – maybe something that someone from Florida would consider snow – I personally wouldn’t call it snow. Did we play Christmas carols? Yea, for a while, it was fun. Did we have a keg? Yes – Syracuse Pale Ale – nothing but the best thanks to Andrew Dougherty. Did we finish that keg despite a relatively small number of people drinking? Hell yes! Did we then go to Swallows for free pizza, wings and beer? Yes! Did we watch SU lose in embarrassing fashion at Swallows? Yes . . . shut up . . . I don’t want to talk about it. 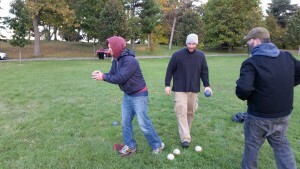 I have to say that I love playing bocce in the fall. The ground is soft and forgiving. You never get those frustrating crazy bounces that you sometimes get in the summer, and as a result the games all seem to be well played and competitive. When you’re a bocce artist like me (think of me as the greasy heterosexual Oscar Wilde of bocce) you’ll trade the perfect summer weather for the perfect bocce ground any day of the week. 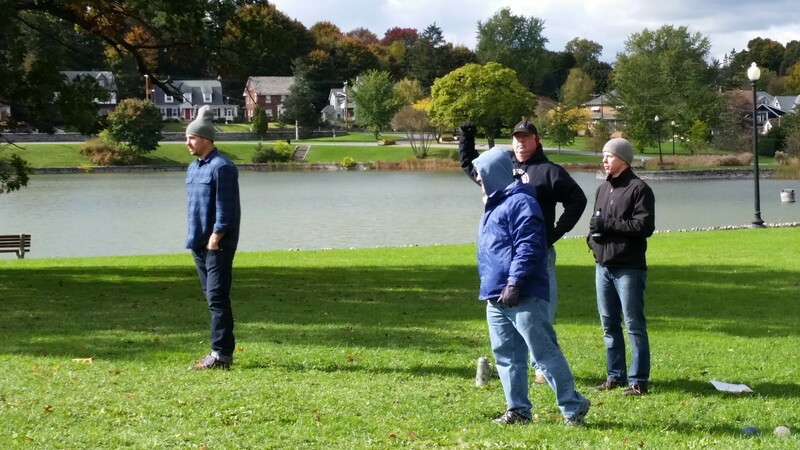 The scenery was as beautiful as the bocce was epic. 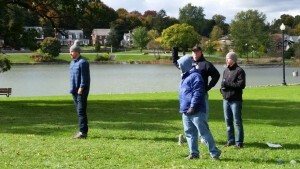 Twenty-four souls braved the unseasonable weather to come play bocce at the site of the first ever Turbo Bocce championship. While the quality of play was strong in general, four teams stood out. These teams took first, second, third and fourth place, and none of them lost to anyone but each other. In fourth place was Amerika’z Most Wanted. Andy Ingalls and Anson Zeppetello are former champions and Turbo Bocce veterans who remember the league’s Strathmore days well. They started this tournament hot, winning an epic 13-11 game against this year’s champions Black Jesus. Eventually losing to George/Tom, and then losing a rematch with Black Jesus to get eliminated. In third place was Black Jesus. After an early defeat (in overtime), Black Jesus showed their championship medal by making it all the way through the losers bracket and getting to within a game of the finals. There they lost (again in overtime) to Breakfast of Champions. In second place was George Christou and Tom Montague. An unlikely pair, both of these guys showed up without partners just planning on watching and decided at the last minute to team up. The one thing these guys have in common is a long history of bocce at Strathmore. George has played in 3 of the 4 Turbo Bocce championships that took place in Strathmore, and Tom runs the Turbo Bocce league that plays every Monday in Strathmore. They won the winners bracket and got to the championship game undefeated before losing back to back games to Breakfast of Champions. Breakfast of Champions won the tournament in fitting fashion with Andy Thompson throwing the winning shot on what was very much a celebration of his 40th birthday. 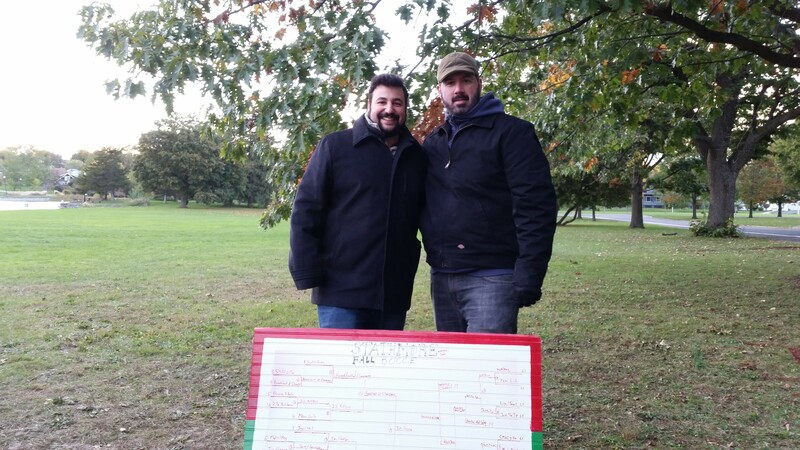 After losing to George/Tom in the finals of the winners bracket, Breakfast of Champions emerged from the losers bracket to beat George/Tom twice in the finals to take the tournament victory. The winners bracket of this double elimination tournament ended up with a final four of Amerika’z Most Wanted vs George/Tom and Breakfast of Champions vs. 2 ½ Kittens, with Breakfast of Champions and George/Tom winning the games and needing to play each other for a birth in the finals. Meanwhile the losers bracket ended with of Amerika’z Most wanted against Black Jesus (who kept winning all day after that close early loss). George/Tom beat Breakfast of Champions 11-9 to get to the finals undefeated. There they would only need one win to earn the crown while their opponent would need to beat them twice. Tom Montague and George Christou played like champions. Black Jesus got redemption over Amerika’z Most Wanted, eliminating them from the tournament, and moving on to play Breakfast of Champions for a birth in the finals. 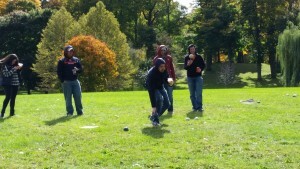 In the Breakfast of Champions vs. Black Jesus game, Black Jesus was up 11-10 with a ball in for the victory. Andy Thompson beat that shot, and Black Jesus threw three balls trying to knock Andy’s shot out. After they used all their shots, Paul Colabufo bocced out Black Jesus’s only close ball, allowing Breakfast of Champions to take four points and the 14-11 victory. The finals were now set. Breakfast of Champions vs. George/Tom with Breakfast of Champions needing to win two games in a row to win the tournament and George/Tom only needing one win. George/Tom got off to a fast start, taking an 8-1 lead. In one round George had two aces with the pallino about 45 feet away. Tom played great as well. With the score at 8-1, Breakfast of Champions began their comeback. Paul bocced out one of Tom’s aces to make the score 8-2, then a four point round made the score 8-6. George/Tom continued to make good shots, but Breakfast of Champions was always able to get a bocce, or an ace when it mattered. In the end Breakfast of Champions won 11-9. In the second game, Breakfast of Champions was able to keep their momentum by keeping the pallino for most of the game and playing short. Andy Thompson threw the winning shot, and the final score was 11-4. Andy Thompson wins the tournament on his 40th birthday then poses with the big bracket. Its rare to see the team that emerges from the winners bracket lose in a double elimination tournament. In fact, I don’t remember ever seeing it before. But Strathmore (so often the site of legendary bocce tournaments) proved to have a little magic left as history was made once again.